Records of the superstition are rarely found before the 20th century, when it became common. So why do people think Friday the 13th is a fateful day? 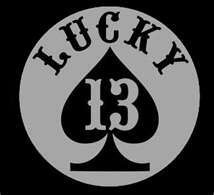 It’s probably the combination of two older superstitions: thirteen is and unlucky number and Friday is an unlucky day. What’s your lucky number and are you superstitious about it? And more importantly, do you suffer from friggatriskaidekaphobia?? ?